The hot process rebatch method of soap making can give new life to those ugly failed soap batches that, sadly, happen to all of us at one time or another. 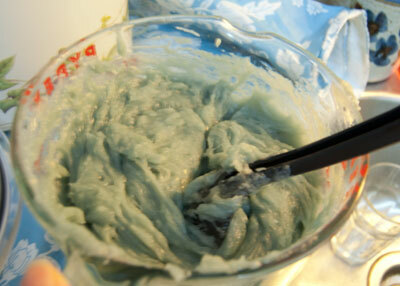 One of my recent experiments using a natural colourant resulted in a soap that was dirty dish water grey. It was really quite ugly and I wanted to give it a bit of a make-over. Awhile ago I stumbled across Ridgeway Soapworks and was really impressed with her hot process soap making method and her beautiful soaps. Her tutorial inspired my decision to try incorporating the ugly soap into a batch of hot process soap and see what resulted. 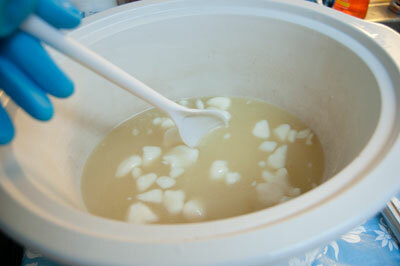 Basically combining hot process soap making and rebatching soap into one method. I think it worked out rather well considering what I started out with (next picture below). The only thing I'm disappointed about is not stirring in the essential oil enough. You can see the swirl of lemongrass in the top picture. We'll just pretend that I did it on purpose...ok? When deciding on which colour to make your soap, make sure to stick with something that is in the same colour family as the ugly soap you have. That way you have a good chance of the colour coming out as planned rather than as a muddy mess! Orange soap 1/4" cubes - 200 gr. 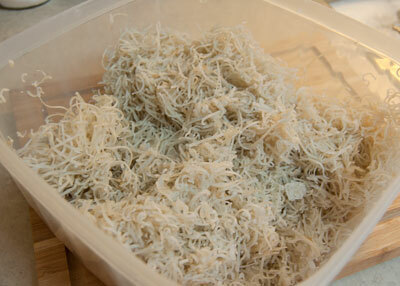 Finely shredded ugly soap - 600 gr. 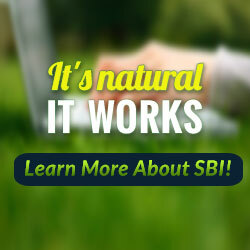 Our first step is to prepare all of the additional ingredients. Place the coconut milk, yoghurt and sodium lactate into a jar and seal. Measure out the kaolin clay and the lemongrass and place them into separate jars as well. Weigh out your super fat. Normally, with cold process soap making we don't do this but for this method we will be adding the super fat in after the soap has cooked. I chose to use the shea butter and placed 45 grams of it into a jar, melted it and placed it aside. Prepare the colourants by mixing them with an equal amount of olive oil and blending until there are no lumps. Chop up the orange soap (or whatever soap you choose) into small cubes. I also dusted them with white mica for fun. Finely shred the ugly soap. 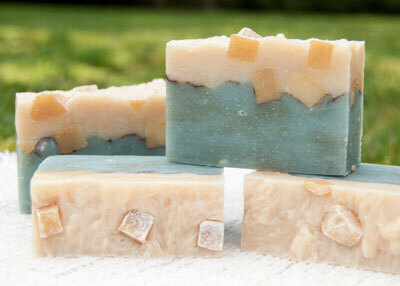 Superfine shreds will insure that the soap completely melts down and disappears into the hot process batch. I placed my soap mould, super fat, coconut milk mixture, lemongrass essential oil and glass mixing bowl into my oven that had been pre-warmed at it's lowest setting and turned off. The colourants I placed on top of the oven to keep them warm as well. I did this to ensure that nothing would be cold when it came in contact with the hot soap later. Measure your hard oils into your crock pot. Don't forget that you have already measured out some of your shea butter so what you measure now should be 45 grams less. ie. 180 grams. Measure the liquid oils and place aside. Pour your hot lye over the hard oils and turn the crock pot on to low. Gently stir the mixture until the hard oils have melted and then add in the liquid oils. 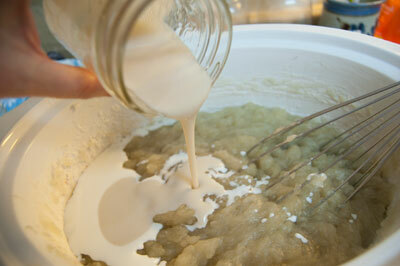 Mix in the kaolin clay and bring the soap to trace. 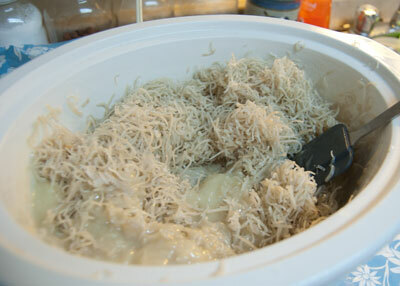 Once the soap has reached a medium trace, add in the shredded soap bits and mix in completely. It will look like porridge. 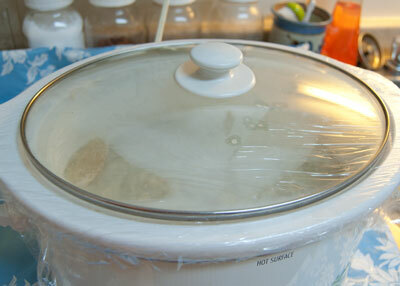 Place cling film over the top of the crock pot to seal in the moisture. Put the lid on to help keep the heat in. You can now leave the soap until it reaches a full gel. It took about an hour for this batch. Keep an eye on the soap, make sure it doesn't get too hot and try to crawl out of the pot. Once the soap looks to be gelled, you can gently sneak a thermometer under the cling film to test the temperature. Mine registered at 180 degree Fahrenheit so it was ready for the next step. 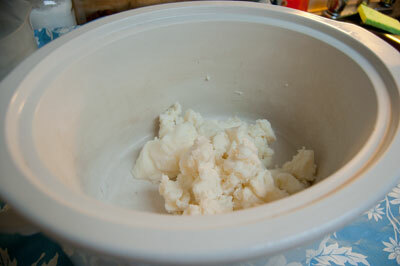 Turn off the crock pot and give the soap a good stir with the whisk. 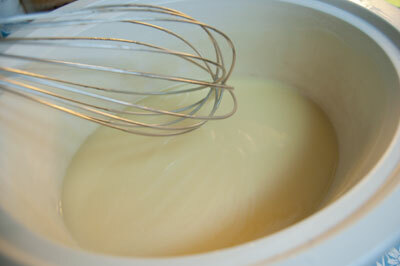 Pour your warmed super fat and coconut milk mixture into the soap batter and mix really well. Put the lid back on the crock pot and clear your area of messy dishes. Get your soap mould ready and bring out the mica colourants. Open up the crock pot and give it a good stir. It should be much more fluid now and have a nicer texture. I wanted to have a layered soap so I scooped a good two thirds of the soap into my glass measuring bowl and added in the turquoise mica. Mix in the colour well. Now add in two thirds of the lemongrass essential oil and mix it better than I did! 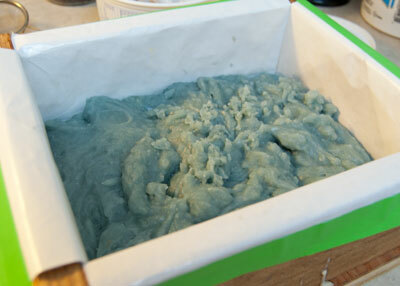 Pour or glop the blue soap into your warmed soap mould and give it a jiggle to flatten it out. Because things were moving along at a good pace and I didn't want the soap to cool too much, there are no more pictures...sorry. It's hard taking pictures while making the soap! I decided to have a thin dark line so I sifted a small amount of cocoa powder over the soap base and then sprinkled on the orange soap chunks. I pushed them in a little as well. I went back to the crock pot and added the white mica to the remaining soap, mixed well and then added what was left of the lemongrass essential oil. Once the white soap was well mixed, I gently spooned it on top of the soap chunks. Be sure to give the soap mould a nice good thump onto your table top to make sure there are no bubbles. At the end I had some extra soap chunks left over and poked them into the soap top but I don't recommend doing that as the top cools too quickly and the chunks do not adhere very well. Next time I will add them directly to the hot soap batter before adding the layer to the soap mould. And there you have it! 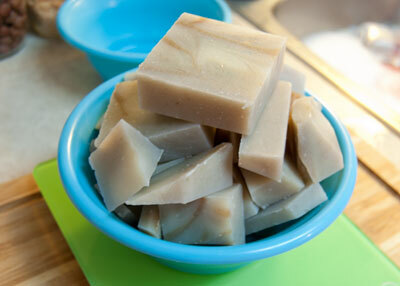 Hot process rebatch soap making to the rescue!